Built to survive the real world: drop it on a concrete warehouse floor, shake it as your truck hits pothole after pothole, carry it from the truck in a rainstorm, and watch as the MTP4 just keeps on printing. 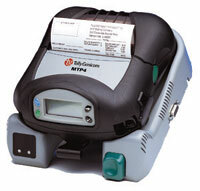 Made to be customized for your specific needs: add a mag card reader, or a vehicle mount, or a variety of battery charging options, or wireless communication, all in modules that mean you don’t replace the printer itself when your needs change. The angled LCD provides human readable messages rather than blinking lights to interpret, the clamshell design with automatic media centering allows simple and easy drop-in paper loading, and intelligent Lithium Ion battery technology provides long battery life with many different charging options. Optional Accessories - Options include Magnetic stripe reader, vehicle cradle for docking and charging, shoulder/hand straps, fast AC charger and environmental Soft Case. Core: .75 or 1.38 inches I.D. Width: 2 inch to 4.12 inch; Roll Size: 2.25 inch O.D. 4.0 Ah, 7.4V battery, External charging options (vehicle and AC), Meets IP54 rating.